Wow. Where has the week gone? Seems like it just disappeared in a whirlwind of monthly reports, mountains of invoices and precarious piles of to-file's. Oh how I long for the simpler days of long weekends... Erm.. wait, didn't we just have one? Mmmm... I really need to have a look at this memory loss problem I'm experiencing. Because we did actually have a pretty relaxing long weekend at the West Coast, so I can't legitimately blame exhaustion much longer, can I? Well, let's just call it the midyear crazies then, shall we? And on top of that, I have to juggle various secretive missions for TheHusband's upcoming 30th in September. Can you believe I will be married to someone not in their twenties anymore (i.e. an official "oldie") soon? *Sigh* These are tough times, I tell ya. 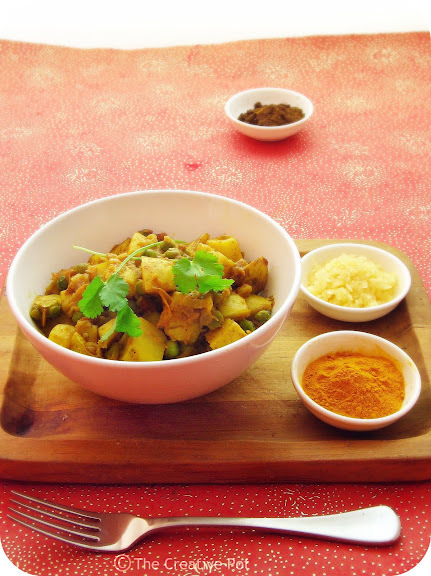 Thank goodness for low maintenance feel-good meals like this potato curry. It's got just the right amount of bite, balanced by the mild starchiness of potatoes and the occasional pop of green courtesy of the peas. Although, if you are an ardent lover of all things tear-inducing you might want to dial up the heat on this one, as it is fairly mild. 1. Heat oil in a medium sized saucepan, then add onion and garlic, sauteeing over medium heat until softened. 2. Add potatoes, salt, ginger, garam masala, turmeric and cumin and stir to coat the potatoes with the spices. Cook, uncovered over medium heat for 10 minutes, stirring a few times to prevent the potatoes sticking to the bottom of the pan. Add a little bit of water, if necessary, to prevent burning. 3. Stir in the tomato paste and chopped tomatoes, bring to a boil, then turn heat down to a simmer, cover and cook another 10 - 15 minutes or until potatoes are soft. 4. Add peas and mix through. Cook another 2 -3 minutes to defrost peas and distribute heat evenly. Serve as is or with rotis and basmati rice if you want to carb it up even more. Mmm yes. I'm totally up for some tear-inducing food. Especially if it's Indian flavored. You really did the humble old spud proud!! Love it and so will my family!!! Joanne - Yup, I think he'll be bowled over! Nina - Thanks Nina! This is really super easy and so flavourful. Enjoy. 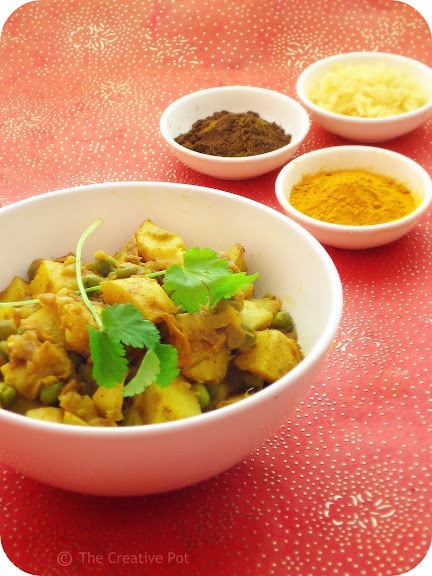 I make a dish similar to this one except it has less potatoes and it includes mung beans (more proteins). Tasty stuff! Potato curry, one of my absolute favourites. Especially for breakfast the next day! Jessica - That sounds pretty tasty as well, can imagine pulses would make a lovely addition. Nicola - Great suggestion, think I should try that next time! Wow Marisa! That looks delectable! My husband and I have really been enjoying cooking Indian inspired dishes...I'm going to add this to my list. I just found your blog tonight, and I'm glad that I did! Loving this recipe. Nice and simple and I have everything in to make it. Interested to see how those sneaky activities will unfold!